In light of this information I think it’s safe to say that the public ‘dialogue’ that B’nai B’rith’s Abe Foxman recently had with Sacha Baron Cohen regarding his “Borat” character was a contrived ‘teachable moment.’ Others have sensed the protection racket angle to his shtick. Sacha Baron Cohen has a new movie, “The Dictator” in which he has a few laughs at the expense of the victims of the Zionist ‘Arab Spring’ hostilities. 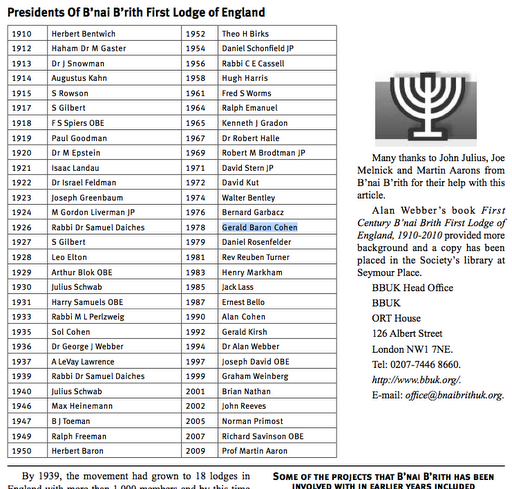 B’nai B’rith is a ‘Jews’-only masonic organization which, among other things, was founded to impede assimilation of Judaic individuals by disrupting the culture and religion of their host nations while simultaneously building up Judaic culture and religion. * I don’t imply that the ADL would have otherwise assisted a defamed Palestinian. ADL Board Member’s Grandson Transformed as ‘al Qaeda’ Agent Threatens ‘Islamofascist’ Attack on U.S.